The following two field prompts in the Domain Constraints definition window of USoft Definer refer to USoft Rule Language. The Old Prompts refer to the prompts that were used for these fields in previous versions of USoft. Other than the prompt name change, domain constraint definition is not otherwise affected when compared with older versions of USoft. 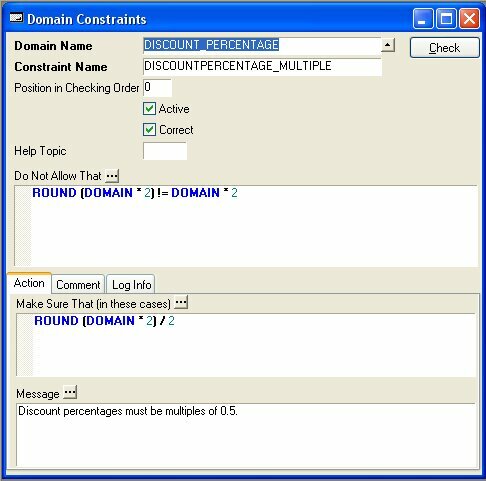 The following examples illustrate how the fields of the Domain Constraints window may be completed for various simple scenarios. They also give an idea of how the naming of the field prompts refer to USoft Rule Language syntax. E-mail address may not contain more than 1 @ sign. E-mail address must contain the @ sign.